Convicted dope cheats such as sprinter Justin Gatlin could still be benefiting from having taken banned substances long after their bans have expired. Research by University of Oslo scientists has established that muscles can retain the advantages given by anabolic steroids decades after the point at which they were taken. The data casts another shadow over once-banned athletes such as controversial US athlete Gatlin, Tyson Gay - the second fastest man in history - and Britain's Dwain Chambers. This summer, 32-year-old Gatlin ran the fastest ever 100m and 200m times by a man in his thirties despite twice having served suspensions. The study has vast implications for the existing anti-doping system, where a first-time offender is unlikely to be suspended for more than two years and may well serve less than half that. Kristian Gundersen, Professor of Physiology at the University of Oslo, who conducted the research in October 2013, told BBC Sport: "I think it is likely that effects could be lifelong or at least lasting decades in humans. "Our data indicates the exclusion time of two years is far too short. Even four years is too short." The performances of Gatlin - 2004 Olympic 100m gold medallist and double sprint world champion in 2005, who was banned for four years from 2006 to 2010 - have caused disquiet in the athletics world all year. Dai Greene, Britain's 2011 400m hurdles world champion, told BBC Sport: "He's over the hill as far as sprinting is concerned - he should never be running these times for the 100m and 200m. "But he's still doing it, and you have to look at his past, and ask how it is still affecting him now, because the average person wouldn't be able to do that." This summer Gatlin ran six of the seven fastest 100m times in the world, and in Brussels completed the fastest ever one-day sprint double, clocking 9.77 seconds for the 100m an hour before running the 200m in 19.71. Greene said: "Those are incredible performances. Not many people have run that fast separately, ever. To do it on a damp Friday night? I couldn't believe those times. "It shows one of two things: either he's still taking performance-enhancing drugs to get the best out of him at his advanced age, or the ones he did take are still doing a fantastic job. "Because there is no way he can still be running that well at this late point in his career. "After having years on the sidelines, being unable to train or compete, it doesn't really add up - 9.77 is an incredibly fast time. You only have to look at his performances. I don't believe in them." Gundersen's team studied the effect of steroids on female mice, but he is convinced both that the same mechanism is at work in human muscles and that other performance-enhancing drugs would have similar long-term benefits. 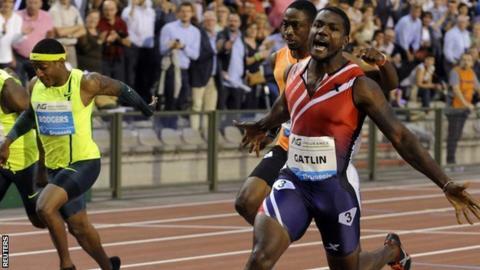 Gatlin, unbeaten all year, has not tested positive since returning to the sport in 2011 following a four-year ban. He was originally handed an eight-year suspension (he had previously tested positive in 2001) which was cut in half by an arbitration panel. But Gatlin's nomination this weekend as one of the IAAF's male athletes of the year has triggered anger in the sport, with another nominee, Germany's Olympic discus champion Robert Harting, asking for his own name to be removed from the list in protest. In November 2013, the World Anti-Doping Agency (Wada) approved stricter punishments for athletes found guilty of doping, doubling bans to four years from January 2015. A first major offence had carried a two-year ban, with athletes banned for life if they tested positive again. Wada was unavailable for comment when contacted by the BBC. Formerly coached by Trevor Graham, now banned for life after eight of his athletes - including Olympic champion Marion Jones and world record holder Tim Montgomery - were banned for doping, Gatlin is now trained by Dennis Mitchell, himself banned for two years as an athlete for taking testosterone. His agent Renaldo Nehemiah told BBC Sport: "Justin would have run these times, and faster, had his over-zealous coach Trevor Graham not tried to get him there sooner than he would've naturally gotten there. "So, what Justin is doing right now, I'm not surprised by that. "His body is rested for four years, so he wasn't racing. And he was the talent that I always knew he was. "It's between the rest, and the talent that he always had, and the determination to prove everyone wrong, to prove that he was always this good." Nehemiah, one of the great sprint hurdlers in his younger days as well as a wide receiver for the San Francisco 49ers, said: "You can do a study - I always say that if you have an argument you can find any panel of experts to support that argument, and then I can find a panel to dispute it, I'm sure. "I say to Justin: 'Listen, some people will never forgive you. Forgiveness isn't a part of their make-up, their DNA. This is a part of maybe your legacy that you will never overcome, because of what decisions you made years ago."